Freedom ’84 was one of promoter Dan Webster’s (Greenland) first promotion endeavors in Montréal. After moving to Montreal from other parts of Canada, and noticing that many of Montreal’s unique bands had not put their sound on record, he decided to document the developing punk scene by means of a compilation LP. Many groups were featured on the record including Genetic Control, Asexuals, No Policy, the Nils, Red Shift, the American Devices, and more. 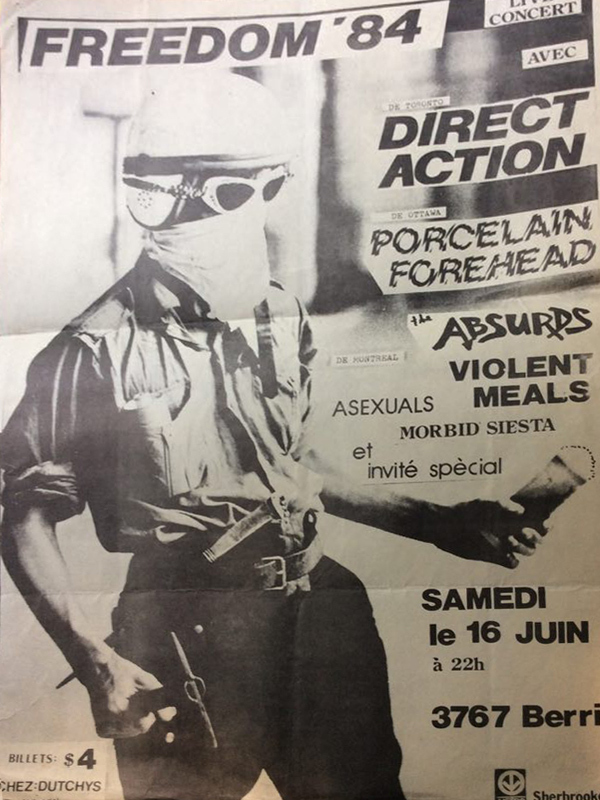 In order to raise money for the recording, a punk rock extravaganza was held in the basement of a church on rue Berri and entitled Freedom ’84. The fundraiser that featured a skateboard demo, tattooing and haircutting drew close to 300 people. The event raised most of the costs needed to make Primitive Air Raid which was released in September of 1984.